In the culinary world, presentation is almost everything. Sure, your food needs to be delicious, but if it doesn’t look appetizing, good luck getting anyone to try it! 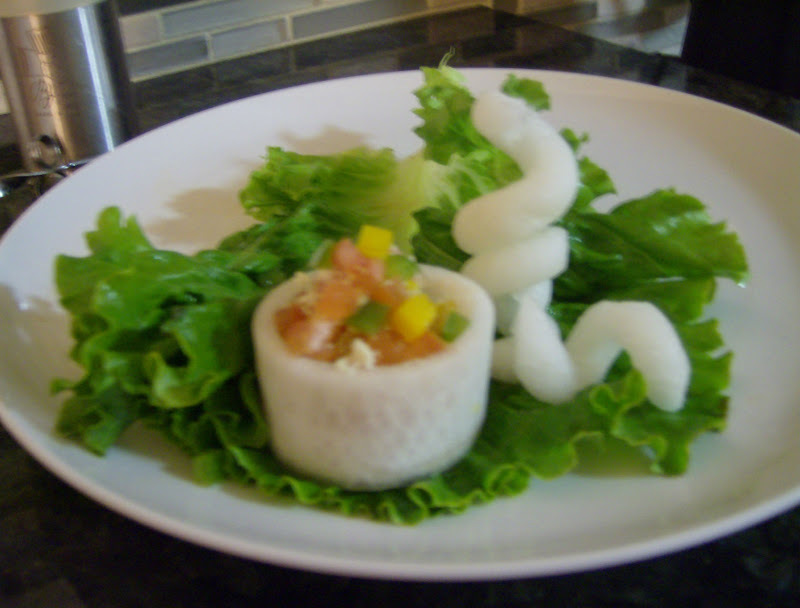 One way to add some presentation glitz to your plates is with edible garnishes. Flower designs made from vegetables like carrots or onions can take a simple salad to the next level. Now, some chefs go all out on the garnishing front, creating pieces that can more properly be called art. If you’re just starting out, designs like that might be above your pay grade – so let’s talk tips for novices. One of the best ways to get started is with Chef Harvey’s Garnishing for the Beginner Kit. The well-illustrated book displays many of the easier techniques. It also comes with five tools to make basic garnishes a breeze. The tools – V-knife, twin-curl cutter, bird’s beak parer, crinkle cutter, and spiral slicer – are all sold separately, but at just $14.99, this kit is a great deal. 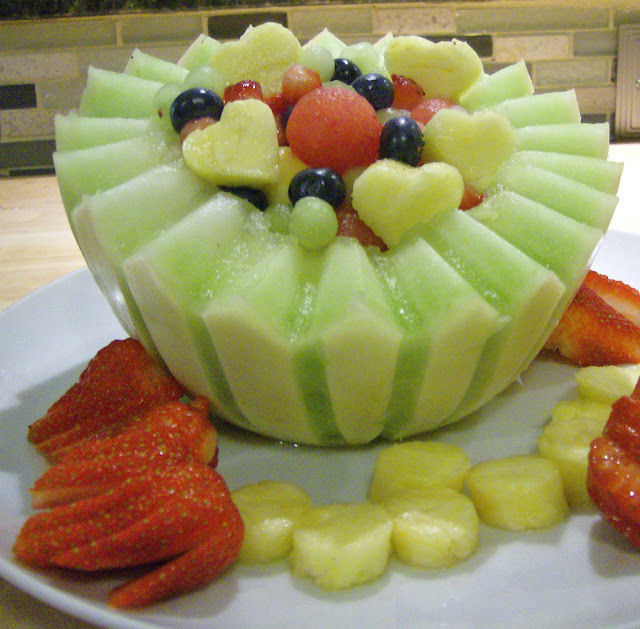 The V-knife is one of the most basic tools in garnishing. This multipurpose tool is great for cutting decorative V shapes out of melons (as seen in the picture at the top), coring tomatoes to use as dip cups, and much more. The rounded end can be used to scrape grooves into the sides of fruits and vegetables, or to strip the rind off citrus fruits for cocktail garnishes. A birds’ beak parer is short and curved, and can be deftly handled for controlled cutting, so it is widely used for garnishing foods. The only tool used to create the blue onion at left – yes, that is an onion – was a bird’s beak parer. Onion flowers are beautiful and actually quite easy to create. Place the onion root-side-down and, using a paring knife, make vertical cuts around the onion almost down to the bottom. Leave at least 1/4″; if you cut too far, the flower will fall apart! Submerge the onion in a small saucepan of nearly-boiling water and leave it for about 30 minutes. (This will rid the onion of its strong odor.) Then carefully remove the onion from the hot water and place it into a bowl of ice water. As the onion sits in the cold water, the “petals” will begin to pull apart from the center of the onion, forming a flower over twenty minutes to an hour. 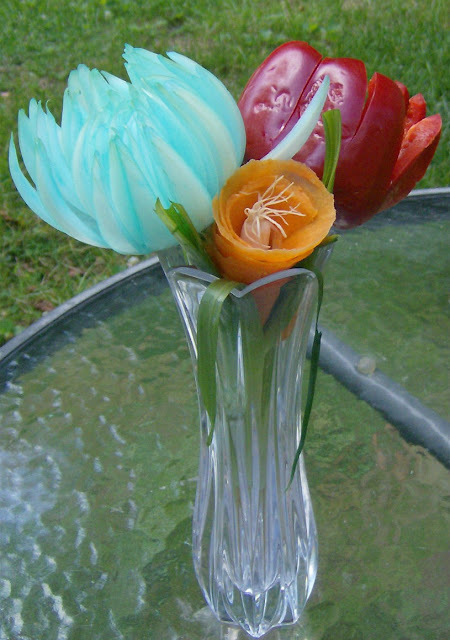 You may need to add ice to the bowl to keep it cold while the flower is blooming. If you’re using a white onion, you can add food coloring to the water to create brilliant colors. You can see the effect blue coloring had! It’s even easier to make a carrot flower. Take a carrot and peel the hard outer skin off. Then, take the carrot and twirl it into a carrot curler, just like you were using a pencil sharpener. You’ll end up with a twirl of carrot that you can easily form into a flower or add to a salad for an edible twist. This same technique works well with cucumbers, daikon, and potatoes. Bake the potato curls in small ramekins or roasting dishes and serve as a side dish with a steak dinner! Another really fun tool is the Turn’Up by Bron. This professional tool turns cucumbers, daikon, or even potatoes into little canape shells. Fill them with whatever you’d like – salsa, veggies, shrimp, or really anything – and serve them as hors d’oeuvres at your next shindig. Even the most educated foodie will be fooled into thinking you have a professional caterer. Check out the video to see how it’s done! If you really want to impress your guests, try out a spiral cutter. This simple tool creates curls and spirals of vegetables that look incredibly complicated – even though all you have to do is twist the cutter slowly through the food to create them. Come visit us at our Italian Market Store this Saturday from 11 to 3, and Nadia – who made all the garnishes pictured in this post – will show you the ropes. 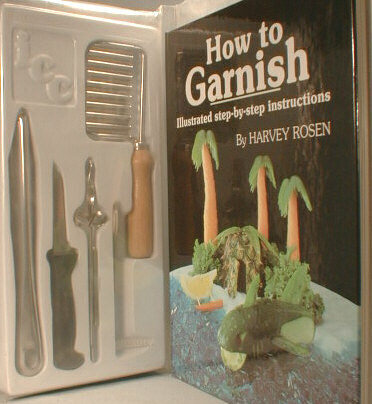 And one lucky person will get a garnishing kick-start – we’re giving away a copy of Harvey Rosen’s How to Garnish, a more comprehensive version of the beginner kit described above. Stop by the store this weekend to fill out an entry form. You won’t want to miss this!